In the Fall of 1969, Professor Christopher Levenson of the English Department of Carleton University published a full-page statement in the first issue of a new journal, Comparative Literature in Canada Newsletter, in which he suggested that “a group be formed of Canadian university professors who have an interest in Dutch studies, their names circulated to all Arts faculties in Canada so as to encourage interest and support for programs of Dutch studies at selected universities.” He furthermore suggested cataloguing Dutch holdings in libraries, and the circulation of a Newsletter giving information on conferences, publications, exhibitions etc. Encouraged by the response to his announcement, Prof. Levenson together with other interested persons began to consider organizing on a more formal basis soon afterwards, while at the same time Prof. Levenson began editing the first Newsletter. These and other efforts culminated in the formal founding of the Canadian Association for the Advancement of Netherlandic Studies (CAANS) during a meeting of the Learned Societies at Memorial University in St. John’s, Newfoundland on June 3, 1971. Despite these auspicious beginnings, activities were initially almost exclusively limited to small, albeit enthusiastic participation by individuals at the following Learned Societies’ conferences. As Joan Magee has put it, “During the years of effort which followed, the members from Ottawa and Kingston . . . saved CAANS from collapse.” The formation of local chapters had been encouraged from the beginning, and it is these which to some extent kept the Association alive. In fact, it could be argued that it was a conference organized by the CAANS – Windsor Chapter in 1978, in which 19 professors and students participated, which gave new impulse to the Association, for the following decade, the 1980s, saw the mandate originally enunciated by Prof. Levenson beginning to be fulfilled in earnest. To begin with, two more conferences were held in Windsor, each time with a larger attendance and an expanded program. These meetings set the example for a major conference on Dutch Emigration to Canada in Toronto, organized by Mark Boekelman. The founding of the Montreal Chapter in 1980, and of chapters in Winnipeg and London set the stage for further expansion. In addition, Dutch courses were started at the University of Windsor (Dr. Louise Nelson), the University of Waterloo (Prof. Sander Zweers and Dr. Remkes Kooistra), in Toronto (Prof. A. P. Dierick), and, with a few years interval, at Brock University and the University of Calgary. 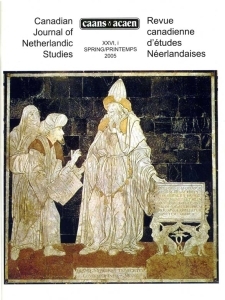 The “years of effort” were over, the “advancement” of Netherlandic studies well on its way. Symbolic of the more formal arrangement of the Association was the adoption, after broad consultation, of a constitution by the Association at its meeting in Ottawa in 1982. Let me summarize the achievements of the Association following the detailed report on the first decade published by Joan Magee in the Canadian Journal of Netherlandic Studies, Fall 1981, Spring 1982. Since its foundation in Newfoundland, CAANS/ACAEN has organized an Annual Conference at each meeting of the Learned Societies (since 1998 the Congress of the Social Sciences and Humanities), from Prince Edward Island to Victoria, B. C. and many university locations in between. In addition, local chapters have organized conferences on a host of topics, such as “La présence des Néerlandophones au Québec” (Montréal), “Dutch Culture in Perspective” (Toronto), “Literature and Religion” and “Literature and the Second World War” (Waterloo), a conference on Hugo Grotius (Montreal) and one in Calvin College, Grand Rapids, Michigan (1984). CAANS/ACAEN has vigorously supported the teaching of the Dutch language at all levels. Under the auspices of the Secretary of State, it has organized language classes at the elementary level under the Language Heritage Programme in many cities. At the post-secondary level, as indicated above, courses in language, literature and culture were given in several universities. CAANS/ACAEN also participated in a number of important surveys on language instruction initiated by Dutch government agencies, and organized workshops on language teaching in London, Ontario (with the participation of Prof. Jos Wilmots, director of the Courses in Dutch for foreigners in Diepenbeek, Belgium), and in Ottawa. In the area of literature, CAANS/ACAEN was able to welcome a number of distinguished authors, among whom Marga Minco, Renate Dorrestein, Irene van Goeree, and Kristien Hemmerechts. A highlight in this connection was the Annual Meeting at McMaster in Hamilton (1987), when, under the auspices of the Dutch Bureau of Translation and the Taalunie, we welcomed five (!) authors and journalists. 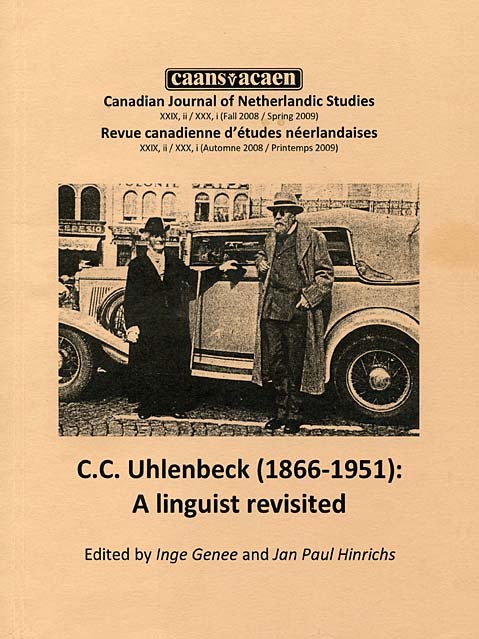 Since 1979 the Association publishes a distinguished scholarly journal, the Canadian Journal of Netherlandic Studies; its first editor was Prof. Adrian van den Hoven (1979-1988) and Basil Kingstone served from 1989 to 2009, when he was succeeded by Inge Genee. In 1996, at Brock University in St. Catherines, the Association celebrated its 25th anniversary with a splendid reception at the home of Prof. John Michielsen. 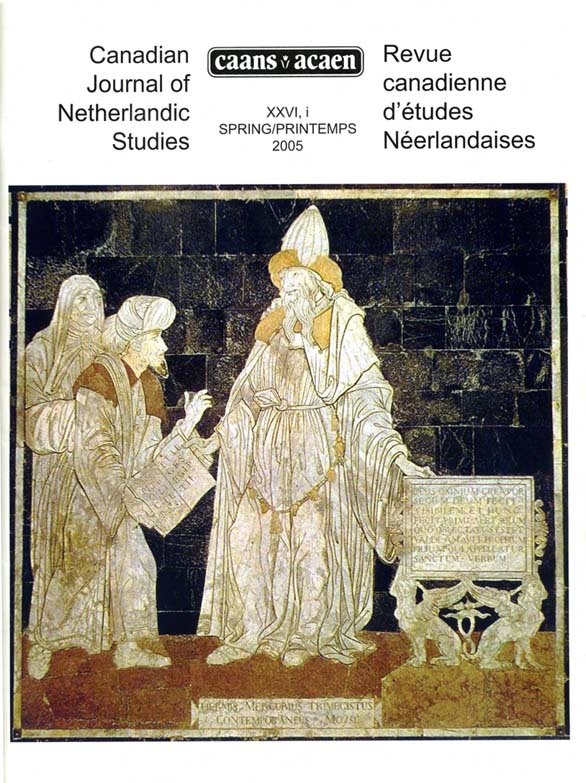 On that occasion a special issue of the Canadian Journal of Netherlandic Studies was prepared, containing some of the best writings published in the Journal. Not all efforts have come to fruition, to be sure. Plans for a Center of Netherlandic Studies in Montreal, of endowed Chairs in Toronto and Vancouver have had to be abandoned. But CAANS/ACAEN continues to flourish and to be a presence in Canada, thanks to its faithful active members. At the National level, the CAANS Annual meetings were held during the yearly Congresses of the Social Sciences and Humanities. The programs of the following annual meetings can be found in the April issues of the Newsletter, while the minutes can be found in the August or September issues of the year the meetings were held. The annual conferences constantly attract new contributors who offer interesting papers (which usually become articles for the Journal), and a loyal core of officers and members attend and read papers as well – it is an annual reunion. Even so, we have lost some friends. We will content ourselves with naming just two of them. Herman van Wermeskerken served for many years both in the Vancouver chapter and as secretary-treasurer of the national organization. Another loyal officer, holding the presidency and other positions, was John Michielsen. His role on the editorial board of the journal was essential, his comments on submissions could be trenchant. “Does nobody know about pronouns any more?” he remarked once. The work of CAANS continues to be appreciated in Europe. Two members received a knighthood in the Order of Orange Nassau. Joan Magee, one of CAANS’s founders, was surprised at an unconnected party at her workplace by Basil Kingstone, who snuck in the Dutch consul. In return, Joan Magee took photos when Basil Kingstone received his decoration – which he had not seen coming either. The Journal has appeared regularly – sometimes late, but always eventually. Issues have been devoted to the widest possible variety of topics, and three issues have been joint publications of a book: two volumes of letters home written by Dutch immigrants to Canada (one from the beginning of the 20th century in Alberta, one between the two world wars), and an account of the life of C.C. 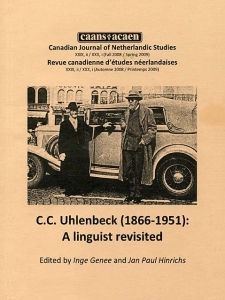 Uhlenbeck, a Dutch linguist who described, among many other languages worldwide, that of the Blackfeet reservation in Montana. Today the Journal, like our Newsletter, publishes online and through open access. This change, of course, affects the membership in its turn. Those who used to pay membership fees in order to receive the Journal, no longer have to. Starting in 2007, the Newsletter was no longer printed, but is produced electronically and emailed to the members and interested parties. Basil Kingstone continued to be the editor and the Newsletter continues to present its readers with an Editorial, News from the Chapters, Book Reviews, the always interesting section From the Journals by Basil with news from Ons Erfdeel, Septentrion, Dutch Crossing, Nieuwsbrief of the Orde van den Prince, and other magazines. The Newsletter contains the yearly programmes and reports of the annual meeting, as well as other news items and documents. Starting with the April 2009 issue, the Newsletter got a new look. Because it was now being produced electronically it could be done in full colour, which made it much more attractive. With the September 2009 issue, Mary Eggermont-Molenaar took over from Basil Kingstone as editor and Paul de Laat and Peter Lowensteyn became associate editors, respectively looking after communications and layout. The various sections did not change, but more variety was added and the size of the Newsletter expanded. During this decade, the Executive remained more or less the same. Functions changed hands, members dropped out and came back, but on the whole the same people continued to run the organization. During the decade from 2000 to 2010, the local Chapters at Vancouver, Toronto, and Montreal continued to have regular scheduled events, not only lectures, but also films and social gatherings. Calgary and Ottawa organized various ad-hoc lectures. Special events were the regular guest-speakers from the Netherlands, organized by Mary E.M. and subsidized by the Nederlandse Taalunie. The first CAANS-evening was held somewhere in 1987, after then president Hermine Joldersma wondered what to do with Hans Visser’s offer to give a lecture about Simon Vestdijk. The evening was a great success. Visser came back three more times and so the Calgary CAANS evenings took off. The people attending were Dutch alumni that had met for the first time in 1986 when Mary E.M. organized the first Cleveringa lecture. Since, the Cleveringa and the CAANS evenings are attended by the same people, Dutch and Flemish alumni, are CAANS members, some are members of the Vlaamse Kring. Also, more than once Cleveringa speakers later on became CAANS speakers and vice versa. Both the Cleveringa and the CAANS evenings are preceded with drinks at 6 pm, buffet dinner at 7 p.m., followed by the speaker at 8 pm. So far, nearly each lecture has been conducted in Dutch (what is appreciated by all). Calgary has one or two CAANS lectures per year and the Cleveringa lecture in November. CAANS is at present the only Dutch formal institution still in operation in Montreal, but the association changed considerably over the years since 1986. In the beginning lectures at an academic level were given in English or French but only attracted a limited audience. To change that, members of the executive introduced Dutch as the main language of the meetings after the original founders of CAANS-Montreal were no longer on the executive. CAANS Montréal, Vereniging voor Nederlandse en Vlaamse Cultuur (CAANS-Montreal, Association of Dutch and Flemish Culture) as it is now called, is still very active and organizes monthly (September-June) lectures, movie showings, as well as yearly poetry readings. Some of the events are organized in cooperation with and supported by the National organization of CAANS. The association attracts an average of 30 to 40 people, mostly of Dutch and Flemish background, to its events. As of 2014 the chapter has been hosting the Cleveringa lectures in Montreal. CAANS Toronto was founded in 1979. Meetings were first held at the Department of Germanic Studies building on St. George Street. We now gather at Alumni Hall on St. Joseph’s on Friday nights. This meeting room has been offered to us free of charge over the years as the Dutch language course used to be part of the curriculum at U of T. It is now part of SCS. Membership was around 60 in the early years and has dwindled to 30, we are trying hard to recruit new members. Meetings are held about six times a year, either in Dutch or English on history, art, language or literature; book presentations have proved to be very popular! We benefit from the ‘travelling’ Taalunie sponsored speakers from the Netherlands. 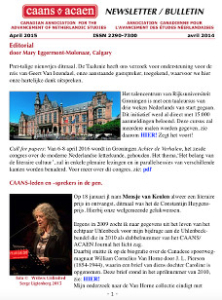 An e-newsletter is sent to members and interested parties a few weeks before a lecture, the contents of which is also put on the national CAANS website. The lectures are also announced on the Dutch Touch, a Saturday morning radio programme. The Dutch Bookclub meets regularly and an account of books read is published in the CAANS national newsletter every year.